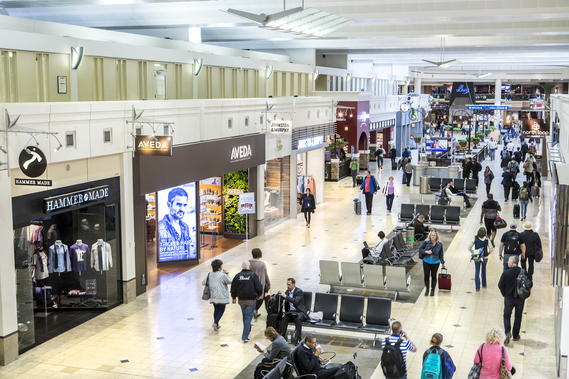 A local full-service steak and seafood restaurant, fresh-pressed juice bar, full-service casual Mexican or Latin cuisine establishment, local full-service bakery and café, and fast-casual Asian restaurant and bar: those are among the 30 food concepts to be developed at Minneapolis-St. Paul International Airport (MSP) by companies awarded the opportunities by the Metropolitan Airports Commission (MAC) board. New food court options in the Terminal 1-Lindbergh mall and on concourses A, C and F will be among the 30 venues as well as a variety of other new Terminal 1 restaurants and coffee shops. The main mall at Terminal 1-Lindbergh. The lease term for all contracts will be 10 years. Venues will be constructed in phases to minimize disruption to travelers, with the first construction beginning in late February 2018, after the Super Bowl. Construction is expected to continue through late 2019. Vendors were selected through a competitive process that involved months of outreach and networking sessions to inform local, regional and national businesses of the opportunity and to encourage innovative development partnerships. The MAC issued a request for proposals in March 2017. The 78,000 square feet of available concession space was divided into seven batches, five of which include multiple restaurant locations. Companies submitted a total of 28 proposals. The proposal review team then spent weeks poring through, discussing and scoring the documents to select the proposals it would recommend the MAC board approve. Each proposal was scored based on concept, merchandising and design plan; rent offer; management and operations plan; employment practices; and Airport Concessions Disadvantaged Business Enterprise participation. The review team’s recommendations were presented to the MAC’s Management and Operations Committee for consideration Sept. 5, and the MAC board made final decisions on the award of each batch at its Sept. 25 meeting. Following is a list of the seven batches for which proposals were solicited, names of proposers and the entity approved for award by the MAC board. NOTE: Under the Minnesota Data Practices Act, the Metropolitan Airports Commission cannot release details of specific proposals – including restaurant names -- until contracts are finalized. Details can be discussed at MAC board and committee meetings to the extent necessary for MAC business purposes. To view the discussion at the Sept. 5 Management and Operations Committee meeting and Sept. 25 board meeting, go to this web page. Includes location of the current Ike’s Food and Cocktails, French Meadow Bakery and Café, and Rock Bottom Brewery in the airport mall. Requested concepts: Full-service bakery and café bar (local); full-service steak and seafood bar and restaurant (local) and fast-casual Asian restaurant and bar. Proposing entities: Areas Aero MSP JV, LLC; HBF Twin Cities Partners JV, LLC; Host BGB SCA MSP, LLC; MCE-MSP, LLC; MSP True North Stag, LLC; SSP America MSP, LLC. Awarded to: Areas Aero MSP JV, LLC. Includes location of the current food court (Caribou Coffee, Charley’s Philly Grill, Famous Famiglia/LaBrea Bakery Cafe, Wok & Roll, Burger King, Subway, Arby’s and Ben & Jerry’s) and Axel’s Bonfire in the airport mall. Requested concepts: Six food court venues and a nationally branded full-service casual bar and restaurant. Proposing entities: HBF JLB Partners JV, LLC; Host BGB SCA MSP, LLC; MCE-MSP, LLC; SSP America MSP, LLC. Awarded to: Host BGB SCA MSP, LLC. Includes locations of the current La Tapenade, Burger King, Ike’s on Summit and non-concession areas on Concourse F and Pei Wei on Concourse C. Requested concepts: Four-venue food court; full-service casual Mexican or Latin cuisine bar and restaurant; and a nationally branded full-service casual bar and restaurant. Proposing entities: Areas Aero MSP JV, LLC; HBF TG Partners JV, LLC; Host BGB SCA MSP, LLC; MCE-MSP, LLC; MSP True North Angel, LLC; and SSP America MSP, LLC. Awarded to: Areas Aero MSP JV, LLC. Includes locations of current food court (Caribou Coffee; A&W; Quiznos; and Godfather’s Pizza) on Concourse A; Hometown Sports on Concourse B; Itasca on Concourse C; and O’Gara’s Bar and Grill on Concourse F. Requested concepts: Three-venue food court; full-service café and bar with limited food service; and two full-service casual bars and restaurants. Proposing entities: Areas Aero MSP JV, LLC; HBF TG Partners JV, LLC; Host BGB SCA MSP, LLC; MCE-MSP, LLC; Mill City Hospitality Partners, LLC; SSP America MSP, LLC. Awarded to: Areas Aero MSP JV, LLC. Location of current Caribou Coffee on Concourse F. Requested concept: local coffee concept. Proposing entity: Caribou MSP Airport, a joint venture between Caribou Coffee Company, Inc., and Francicorp, Inc. Awarded to: Caribou MSP Airport, a joint venture between Caribou Coffee Company, Inc., and Francicorp, Inc. Location of current Starbucks Coffee in the airport mall as well as non-concession space. Requested concept: nationally branded coffee. Proposing entities: Caribou MSP Airport, a joint venture between Caribou Coffee Company, Inc., and Francicorp, Inc.; and Host BGB SCA MSP, LLC. Awarded to: Caribou MSP Airport, a joint venture between Caribou Coffee Company, Inc., and Francicorp, Inc.
Minneapolis-St. Paul International Airport (MSP) is owned and operated by the Metropolitan Airports Commission, a public corporation of the state of Minnesota. The Commission is funded through user fees and rents and receives no appropriation from the state’s General Fund. More than 37.5 million travelers used MSP in 2016, ranking the airport 16th nationally.